DNS (domain name service) is what translate a domain name into a number, IP address, from time to time you may need to clean its data by using the flush DNS command in the ipconfig command line on windows operation system. 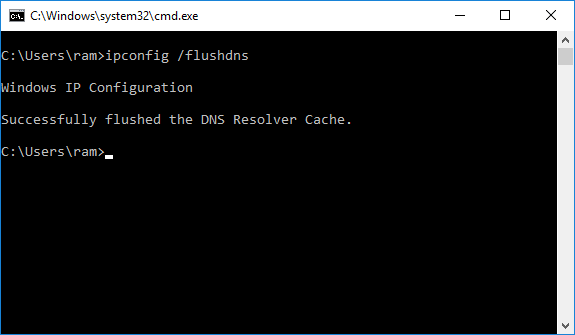 The flush DNS switch in the ipconfig command line tool on windows OS. DNS records are cached automatically by most of the operation system today, this is a method that use to speed up the translation operation when trying to access a domain name over the internet. For us as humans it is more easy to remember domain names, like this site openport.net and not the IP address that represent them for our example its: 107.180.54.186. To Flush DNS or not? Using the build in command line, on the windows operation system, ipconfig it is possible by using its optional parameters to give it the switch to flush the local DNS records and other DNS related data from your device. How to open the command like? Press it and a back window will open with option to type text in it. Tip: all the command line tool on the windows operation system can be use with the “/?” parameter (without the quests) to get help. Why do I need to do a flush DNS anyway? Experience a lot of 404 cases – Page Not Found. Site are open very slow or not open in the web browser. Wrong site is open and the site name is right (can also be sue to a bad DNS record in the DNS cache). Local server name had been change in your local network. Moving from one wireless location to another and the web looks stack. The above recommendation are not the only situation that may be solved due to DNS problem, so in general if you have something that may be reflection with slow browsing, after entering the domain name in the browser, you can try to use the flush DNS command to fix the problem.